Emulsion-based Systems for Delivery of Food Active Compounds is a comprehensive recourse that reviews the principles of emulsion-based systems formation, examines their characterization and explores their effective application as carriers for delivery of food active ingredients. The text also includes information on emulsion-based systems in regards to digestibility and health and safety challenges for use in food systems. Emulsion-based Systems for Delivery of Food Active Compounds is designed for food scientists as well as those working in the food, nutraceutical and pharmaceutical and beverage industries. 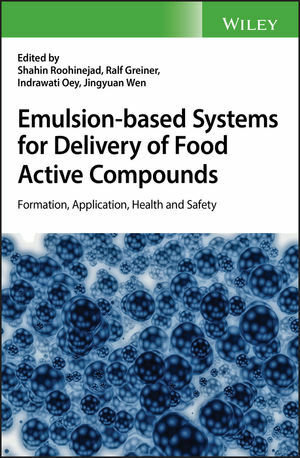 The text offers a comprehensive review of the essential elements of emulsion-based systems for delivery of food active compounds. Shahin Roohinejad, Department of Food Technology and Bioprocess Engineering, Max Rubner-Institut, Karlsruhe, Germany. Ralf Greiner, Department of Food Technology and Bioprocess Engineering, Max Rubner-Institut, Karlsruhe, Germany. Indrawati Oey, Department of Food Science, University of Otago, Dunedin, New Zealand, and Riddet Institute, Palmerston North, New Zealand. Jingyuan Wen, School of Pharmacy, University of Auckland, Auckland, New Zealand.